It took a little time, but here is my Grandma Mayer’s silver plated hostess set all polished, shiny and ready for service. The set consists of a tea pot, coffee pot, covered sugar and milk jug. I don’t know what happened to the matching tray; it disappeared long ago. I found the one they are on at a local thrift store-lucky find! I also found the Towle bell at the same location, and the silver plated sugar cube holder and matching scoop at a rummage sale many years ago. I bought the hot water carafe at Herberger’s many years ago. It is by International Silver and I call it my “Kaiser pot”, because the lid looks like a helmet the Kaiser of Germany wore. A small candle is placed at the bottom of its holder to keep the water warm, for those that would like a weaker strength of tea or coffee. 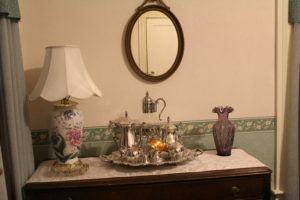 To the left is one of Auntie Betty Jo’s lamps, an antique pressed glass tray, and a lovely purple Fenton Art Glass vase. All take a place of honor on the Pepin Sideboard in The Cottage’s Dining Room.